The soaring, silvery sleekness of this tower, the third tallest in midtown Manhattan, belies its very complex and innovative structure. Easily the most important new building project in New York in the 1970's because of its sheer size, the prominence of its developer and its high visibility, Citicorp Center is the most dramatic skyscraper to be erected in midtown since the Chrysler Building and the raising of its tower on stilts was one of the most daring designs to be completed in the city's history. Many observers saw its high-tech modernity, rakish design and mix of uses as the harbinger of a new and very exciting architectural generation of abstraction. Although one could argue that its spindly legs and asymmetrical top were influential precursors to the explosive and energy creativity of the subsequent Deconstructivist style that blossomed in the late 1980's on the international scene, the reality is that it did not unleash a new era of wild experimentation, influenced only a few buildings, happily in its vicinity, and in many ways was far from perfect. However, in the very difficult arena of Manhattan development Citicorp Center is a remarkable achievement and a popular, if not financial, success. In 1961, Citibank, then the First National Bank of New York, moved into a new tower at 399 Park Avenue, a full-block building directly across Lexington Avenue from this site and just to the north of the Seagram Building. That bland, undistinguished, 39-story tower was designed by Carson & Lundin and Kahn & Jacobs. That same year, Chase Manhattan Bank, First National's chief rival, opened its mammoth new headquarters, designed by Skidmore, Owings & Merrill, downtown, forever changing, for the worse, Lower Manhattan's romantic skyline. The Chase tower, however, was far better architecturally than 399 Park Avenue because of its great plaza with its sculptural tree by Dubuffet and its sunken rock garden and fountain by Isamu Noguchi and its overall, piered design. Many years later, Citibank would silverize its windows at 399 Park Avenue in an attempt, partially successful, to make it more compatible with Citicorp Center, and still later it would redo its ground floor spaces, again for the better but still not enough to overcome its inherently bland design. Within a few years of 399 Park Avenue's completion, however, Citibank realized its headquarters building was too small for its growth and began considering expansion. At the same time, St. Peter's Lutheran Church was experiencing financial difficulties and began to consider selling its increasingly valuable property on the northeast corner of Lexington Avenue and 54th Street, across the avenue from the bank's building, and moving into a smaller and more affordable building. The church's plans attracted the attention of Donald Schnabel and Charles McArthur, brokers with the real estate company of Julien J. Studley & Co., who thought that they might be able to convince a developer to use the church's property as the anchor for a major assemblage for an important new office building project. They approached Citibank, an obvious choice because it was across the street, and persuaded it to allow them to set up several companies for the purpose of discretely acquiring the properties on the church's block to avoid setting off the inflationary spiral that would be generated by public disclosure that a major bank wanted to develop the sites. Alpern and Durst said that brokers Schnabel and McArthur began the assemblage with the purchase of Cafe Chauveron's lease at 139 East 53rd Street. The broker's strategy for the bank, however, quickly ran afoul of Manny Duell, a real estate investor who, Alpern and Durst reported, "somehow sniffed out" the plans, but not the bank's identity, and signed purchase contracts for the Cafe Chauveron building as well as the two buildings on either side of it. Schnabel and McArthur convinced Duell to sell his purchase contracts, which were options, for $2.3 million, or about $430 a square foot. Negotiations continued with many owners and tenants on the block and were successfully concluded only with great ingenuity and perseverance on the part of the brokers. To consummate a deal with the doctors who owned the cooperative Medical Chambers Building on the block, for example, they agreed to merge the building's corporation into the bank's, which gave the doctors $24 of Citicorp stock for every $1 of Medical Chambers stock, Alpern and Durst noted. Two retail tenants on the Lexington Avenue portion of the site, a Howard Johnson's coffee shop and Carroll's Pub wanted to remain for the duration of their leases, so the bank's architect, Hugh Stubbins, was instructed to make provisions for a building to be erected around them, if necessary, that would take into account the eventual demolition of their buildings, which the bank had already acquired. The final part of the puzzle involved the creation of a condominium ownership of the site and the erection of a new church on it for St. Peter's, which was represented by John White of Landauer Associates, one of the city's most astute real estate advisors. The bank built the shell of the new church, designed by its architect, Hugh Stubbins, and gave the church, which had been the site of a memorial service for Louis Armstrong, $9 million. "Although St. Peter's hoped that the sum would give it a substantial endowment, by the time the project was completed, it had all been spent," observed Alpern and Durst. The church's address is 619 Lexington Avenue. The bank did not buy the northwest corner of 53rd Street and Third Avenue because it was already fully developed with an office building. The new St. Peter's church building is shaped abstractly like two hands held together in prayer, with large vertical windows offering passersby glimpses into its interior and the Erol Beker Chapel that contains a large sculptural wall by Louise Nevelson. The church was well known for its jazz programs under the Rev. Ralph E. Peterson, and those programs have continued after its rebuilding. The gray granite-clad church structure's sharply angled form echoes the angularity of the Citicorp Center roofline. At first glance, the form and texture of the church appears a bit ungainly and perhaps it might have been more attractive if it had been clad in the same material as the tower, or even better, a chrome-colored surface. While it was understandable that the church wanted to have its own identity separate from the tower, it is a little lamentable that its unpolished granite facade was not polished or more similar, and better, than the tower's. As it is, the church's facade seems a little like a poor relation.Nonetheless, the contrapuntal concept is marvelous and works well. The bank had hoped that it could convince the city to extend the special zoning district it had created for much of midtown Fifth Avenue to its new site so that it could build a bigger building by including apartments at the top. The angled roofline was originally conceived to be composed of setback penthouses facing south for maximum exposure. The city, however, did not go along with such suggestions, but the striking form took on a design force of its own. 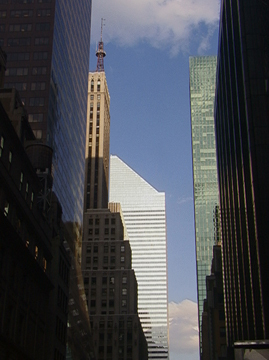 For a long time, however, the slant was planned to go down from the top to the west to relate to the angled top of the Chrysler Building as viewed from north on Lexington Avenue. When the apartment component of the mixed-use project was dropped, however, the bank considered its present configuration, facing south, to maximize its potential for using solar collectors to help lower the building's energy costs. That technology, however, was not well enough advanced and the plan for the collectors was dropped, but the form was kept. Much of the building's mechanical equipment is housed with the slanted top, whose north facade is mostly indented and vented for such purposes. The window-washing gear is concealed behind doors around the base of the building's top above the highest office floor, the 59th. When the doors are opened, the entire top seems to float above the tower, adding a very effective new dynamic to its appearance. In an article I wrote for The Metro, an "interim" newspaper published during the city's newspaper strike in 1978, I suggested that the window-washing doors be kept open permanently and that the bank put a public observatory and/or restaurant/lounge behind the equipment. That suggestion, however, was never taken up. The mechanical spaces at the top, however, do include a "tuned mass damper," a substantial piece of stabilizing equipment that counterbalanced the effect of wind making the building sway. Another technological feature of the project was its separation of elevators to serve only odd or even floors. To further enhance the sense of height at the base, the project has a sunken plaza, which contains an entrance to the ground level of the project's large atrium and also to a subway. The sunken plaza has a waterfall next to its broad staircase at the 53rd Street corner and is one of the few that works rather well urbanistically. The aluminum cladding of the tower and its low-rise, stepped building on the east side of the block unfortunately got quite dirty, a problem with its manufacture that somewhat tarnished its otherwise shiny appearance. While some critics have written that the tower is supported by its four 127-foot-high columns that are placed in the middle of the tower's facades, much of its support comes from its central elevator bank core, which is expressed in a much larger column at the center of the tower's raised base and which is very visible inside the building's large atrium as shown in the picture at the left. Structurally, the tower's shaft, which proportionally is rather slender and quite impressive, was based on a chevron system of diagonally placed girders that are not readily discernible from the outside, an aesthetic decision that is justified not by theory but by the majestic purity of the tower's sleekness. The chevron braces are visible within the offices. The multilevel atrium space is attractive and well laid out, but has been less than a booming success for the many retailers lining its sides. Conran's, a British home furnishings concern was the largest tenant, but announced it would close in 1994. Its leased space actually included two large terraces that extended well out under the tower's uplifted base facing Lexington Avenue and would have made for a visually very exciting location for an outdoor cafe, but my suggestion to the head of Conran's was never taken up. The atrium not only has three entrances directly to the street, but most of its stores on the lowest level, which was the first basement level at Lexington Avenue, also had clerestory windows to permit passersby on the street to look down into the stores and also did not present deadened blank walls to the streetscape, a very nice urbanistic touch. In the late 1990's, the building redesigned parts of its entrance and the base of the low-rise wing in an effort to "upgrade" its stores. The unnecessary redesign is rather frilly and totally at odds with the clean lines of the project, but it was not a disaster. Indeed, Barnes & Noble, the bookstore, took over the large Conran's space and has become a very popular neighborhood attraction and many of the lower-level restaurants and shops have been replaced by Houston's, a very large and very popular restaurant with a very large bar. Another admirable feature of this project was an extremely handsome new streetlamp that incorporated not only street lighting and, at the corners, "WALK/DON'T WALK" signs, but also trash receptacles, emergency city telephones for police and fire, and directional information. The new street stanchions were black and very modern in keeping with the project's ambiance, but also a fine model for elsewhere in the city to replace the atrocious gooseneck stanchions that replaced the graceful bishop's crook streetlamps. In the redesign in the late 1990's of the project's street-level spaces, these stanchions were made white, which might seem to have been more compatible with the tower's facade, but not really. Nonetheless, the stanchions are still excellent. Kudos, then, for this very complex project for its innovations and daring, which not only revitalized both Lexington and Third Avenues, but also midtown with its modernity. The 915-foot-high tower is illuminated at night. The project received an excellent boost from Mortimer Zuckerman's angled 599 Lexington Avenue office building (see The City Review article), which opened up vistas on Lexington Avenue of Citicorp Center. A new office building on the northwest corner of Third Avenue and 54th Street copied the center's facade treatment for the base of its facades at the Third Avenue corner as a complimentary and coy, but not terribly successful, deference to the center also, and 875 Third Avenue sculpted its mass to focus in the center's direction. The soaring Citicorp tower now rises from a very eclectic group of geometrically different buildings and the ensemble is one of the more bizarre and fascinating in Manhattan. In his book, "Privately Owned Public Spaces The New York Experience," (John Wiley & Sons, 2000), Jerald S. Kayden notes that Citicorp Center, "is one of a small group of catalyst buildings whose proposed development literally inspired the legal introduction of a new category of bonused public space, the open air concourse, to the Zoning Resolution." In writing of the sunken plaza, Kayden notes that "water cascades along the face of a primitive, monolithic structure next to the steps, reaching its aural crescendo at the bottom....The views from here are stimulating. Above and east is the underbelly of the cantilevered tower, whose awesome mass and engineering convey the feeling one might have at the base of a rocket." Kayden also writes at length about project's 7-story-high atrium and maintains that "the space features a cornucopia of usable amenities....Thankfully, even at noon when crowds begin to gather, the space is never too noisy or chaotic. Its size absorbs sound, while its muted lighting scheme and natural sunlight intermittently filering through the skylight calm the visual scene. The recent addition of muzak will hopefully be short-lived." "Since its opening 25years ago," Kayden continued, "this covered pedestrian space has displayed a mix of identities molded by private and public aspiratons. For a time, it sought status as a shopping mall, advertising itself through snazzy marketing plaques as the 'Market in the Atrum,' where 'the Sky's the Limit. Boogie Woogie. Rock 'n Roll. And All that Jazz....' Market realities and strategic repositioning eventually altered this approach, replacing it with more modest retail goals," Kayen wrote, although failing to note that in the late 1990s the project's exterior was altered with frilly grills that were trite compared to the project's monumentality as brilliantly designed by Hugh Stubbins. Citicorp Center is the most important New York skyscraper erected after World War II in that it pioneered a major redevelopment of an important area and was both an engineering marvel and an important and striking aesthetic statement. One Chase Manhattan Plaza and the sloping skyscraper at 9 West 57th Street were also very important in revitalizing their districts, but their architectural merits were not quite as much as Citicorp's. The World Trade Center, of course, cannot be neglected in this regard, especially since it ultimately was very influential in the development of Battery Park City and the World Financial Center, but its urbanistic influence, especially initially, was more negative than positive. The Seagram Building and Lever House, of course, were stupendous artistic achievements of great influence although their heights were much less than the other skyline skyscrapers. In 2006, Aby Rosen, the owner of the Seagram Building on Park Avenue, got permission from the city's Landmarks Preservation Commission to transfer some of its air rights to 610 Lexington Avenue, directly to the east of it, to build a very tall and slim hotel and condo apartment tower. The new mixed-use tower would be cattycorner to Citicorp and would have a light-colored facade. It would be significantly taller than the Seagram Building but considerably shorter than Citicorp Center. Sir Norman Foster was the architect for the new project which will better compliment Citicorp Center than the Seagram Building. In 2008, Boston Properties, which acquired Citicorp Center, decided to change its name to 611 Lexington Avenue.